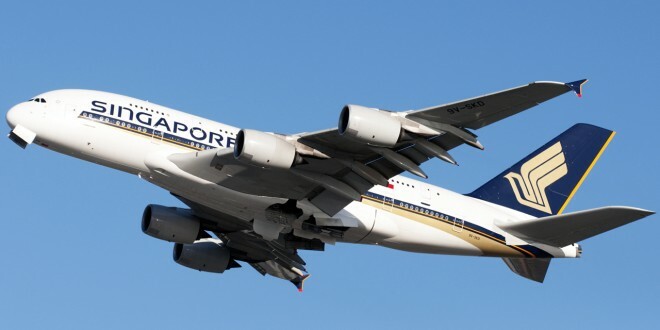 Home >> Airlines >> Other Asian Airlines >> Singapore Airlines >> Photos: New Singapore Airlines A380. Apartment Suites and better Business. 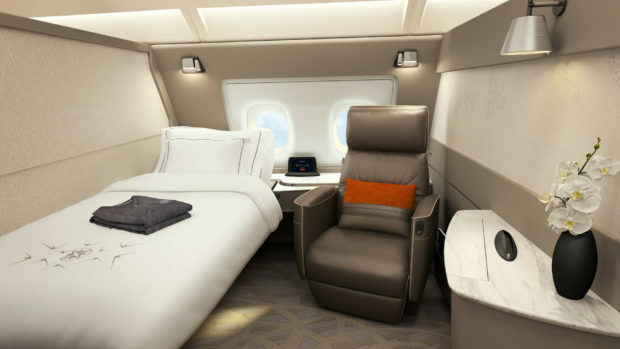 Singapore Airlines has finally unveiled its much awaited new cabin for its Airbus A380 flagship fleet. 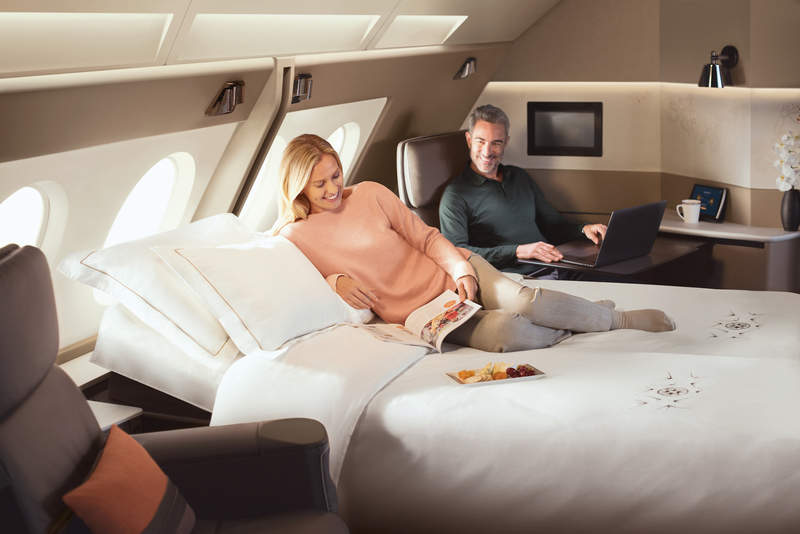 The cabins in all four classes of service, Suites, Business, Premium Economy and Economy are focussed around the theme of “Space made personal, experience the difference”. The new cabins feature intimate and bespoke elements while increasing space and privacy. The new configuration offers 471 seats in four classes. Six suites and 78 business class seats on the upper deck. 44 premium economy and 343 economy class seats on the lower deck. 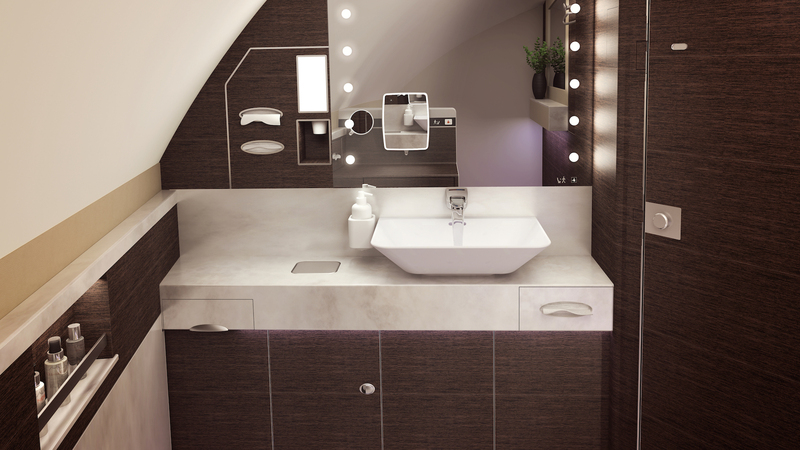 The new cabin products will be fitted into the five new Airbus A380’s the airline will start taking delivery of next month. The existing fleet of 14 superjumbos will also be retro-fitted with the new products for consistency. The total investment in the new products and fitment on the 19 A380s is about $850 million. 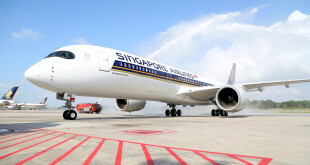 The new configuration will be first deployed on the Singapore Sydney route and it is expected next on the Singapore London Heathrow route sometime in March 2018. Singapore Airlines which first introduced the Suites concept, has taken cues from the Etihad Airways’ First Class apartments for its new Suites product. 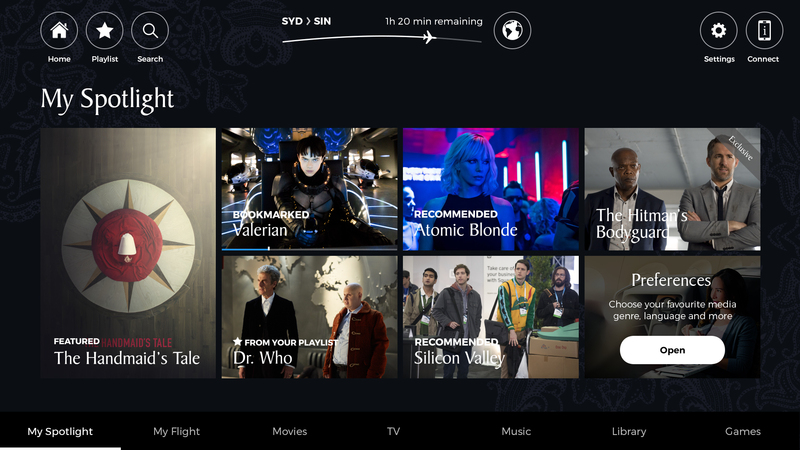 It has opted for a single aisle system with six suites in three rows on either side in a 1-1 layout. The new Suites were designed by Pierrejean Design Studio and manufactured by Zodiac Seats UK. Each suite has a separate full length full flat bed along with a Poltrona Frau leather recliner type chair. In an improvement over the Etihad Apartment, the beds of the first two Singapore Airlines Suites on each side of the aisle can be converted to form a double bed. The recliner type chair is fully electronically adjustable with a recline up to 45 degrees and swivel between 135 and 270 degrees. Each Suite has a 32-inch full HD monitor, a full-sized personal wardrobe, amenity box and a carry-on stowage compartment. A feature wall with mood lighting gives a touch of intimacy. The airline though has not followed its middle-east rivals offering of an on-board shower. 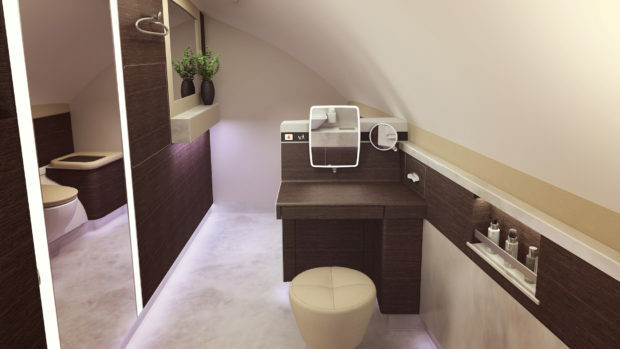 One of the two Suites lavatories features a sit-down vanity station. The new business class seats use lightweight composite materials with a soothing colour and upholstery. The thinner frame allows for full sized carry-on bags to be placed under the seat. Designed by JPA Design the new seats are manufactured by JAMCO. Demonstrating the improved space-efficient design Singapore Airlines has increased the seat count to 78 from the previous 66 retaining the same 1-2-1 forward facing layout allowing direct aisle access to each passenger. 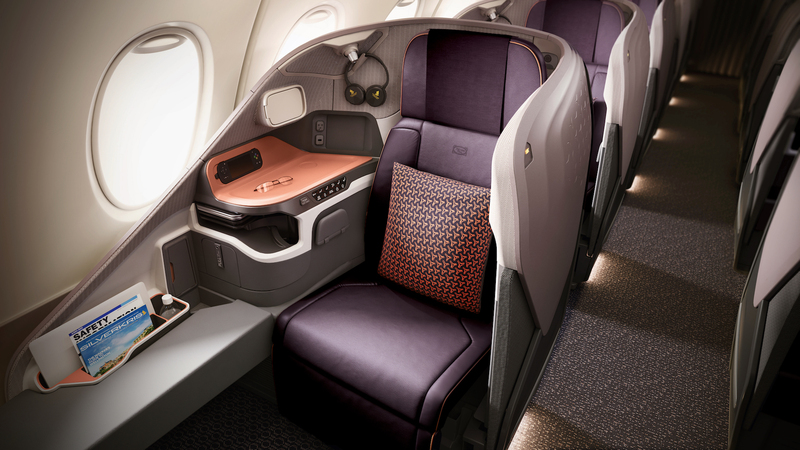 Singapore Airlines new A380 cabin. Business class. 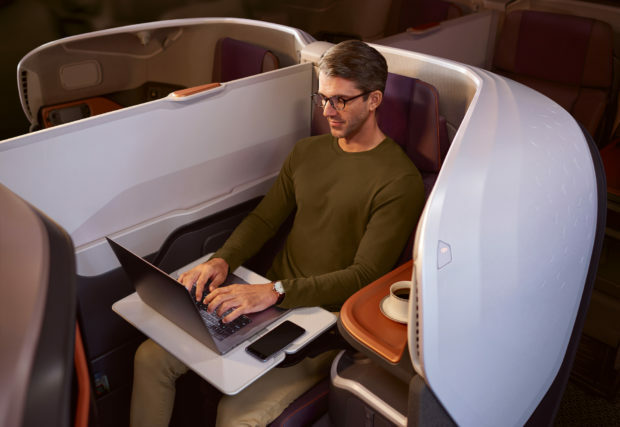 In what I personally appreciate by leaps and bounds, the new Singapore Airlines business class seat directly reclines in to a 78 inch long full flat bed. No more having to fold the seat back and tuck your feet in to the little cubby-hole. While the new seat is 25 inches wide, three less than the previous seat, it has two side wings for better back support. The centre seats are closer unlike the previous version which had the seats to the outside. The Krisworld IFE system can be watched on an 18 inch HD monitor and can be controlled by your iPhone or Android device. Upholstery is by Poltrona Frau. 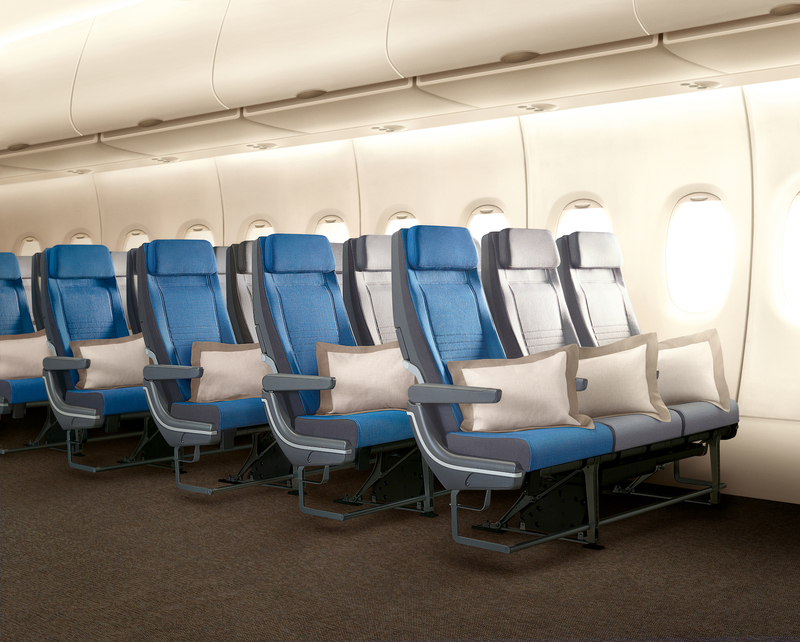 In a first, the centre seats behind each of the three bulkhead rows (11D and 11F, 91D and 91F, and 96D and 96F can be converted into a double bed by lowering the centre divider fully. Ideal for couples and families. However, it still is not a QSuite a’la Qatar Airways. 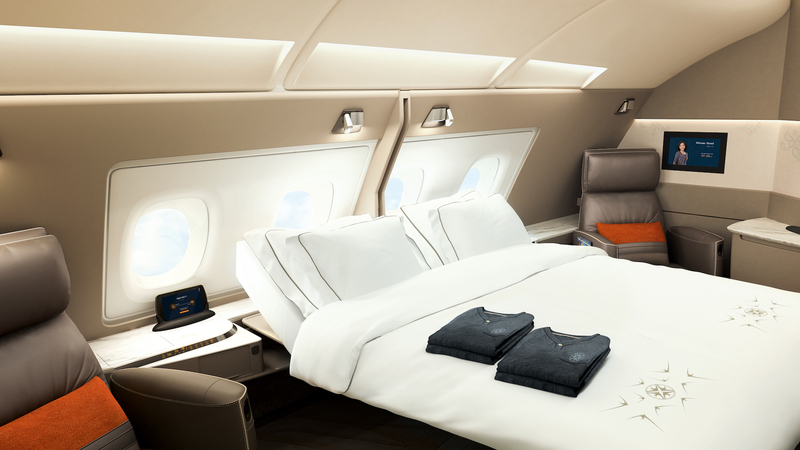 The double bed in the Singapore Airlines new A380 business class. The new business class seats feature a business panel equipped with multiple USB and multimedia ports and in-seat power. Flexible reading lights with adjustable brightness, seat mood lighting, an enlarged height adjustable table allowing for dining and working, and cubby holes for personal items complete the seat. 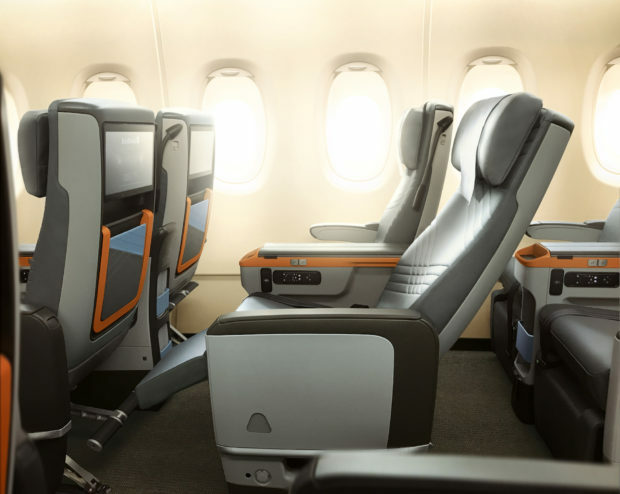 The premium economy class (PEY) has 19.5 inch wide seats in a 2-4-2 configuration and is similar to the existing hard product. 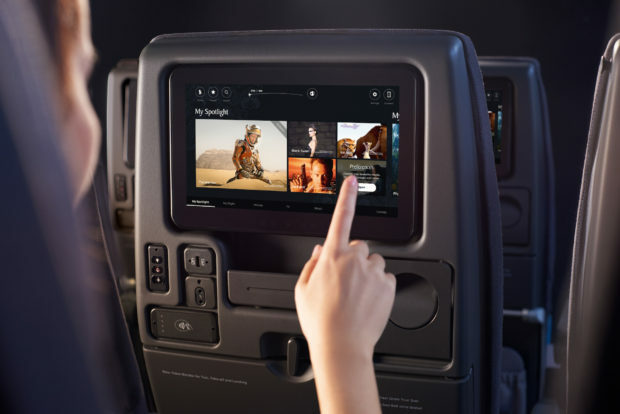 An enhanced Krisworld in-flight entertainment (IFE) system is married to a 13.3 inch full HD monitor with the provision of active noise-canceling headphones. Singapore Airlines new A380 cabin. Premium Economy class. 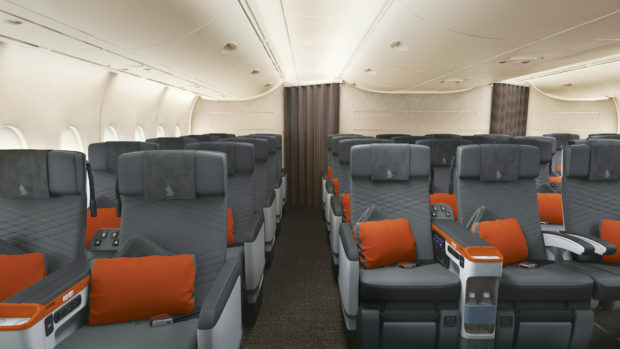 Singapore Airlines new A380 cabin. Premium Economy class. 38 inch pitch. 8 inch recline. The Premium Economy Class seat was designed by JPA Design and manufactured by ZIM Flugsitz GmbH. 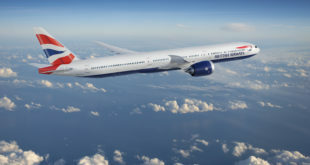 The Recaro economy class seats are 18.5 inches wide compared to the 17 inch on 10 abreast Boeing 777s and nine abreast Boeing 787s. 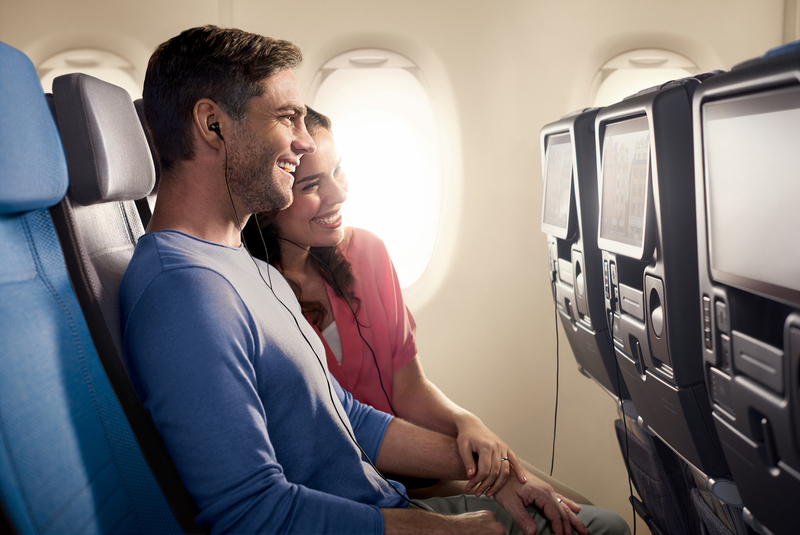 The IFE features a 11.1-inch touch-screen monitor which eliminates the need of handsets. The seats features a patented non-intrusive reading light installed underneath the seatback screen, personal storage space for small personal items, a coat hook, in-seat power supply and ergonomically designed footrest with adjustable positions. Singapore Airlines new A380 cabin. Economy class. 3-4-3 18.5 inch wide seats. 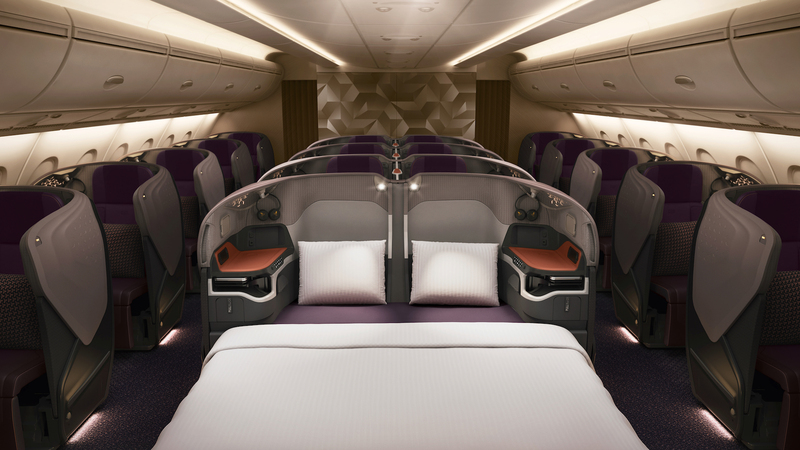 Singapore Airlines new A380 cabin. Economy class. Touch-screen IFE system. Singapore Airlines new A380 cabin. Krisworld IFE system. Singapore Airlines does not have a lounge area onboard its A380s like the middle-east carriers, but its in-flight dining, and pre-order Book The Cook service is one the best in the world. A small gallery to tickle your taste buds. 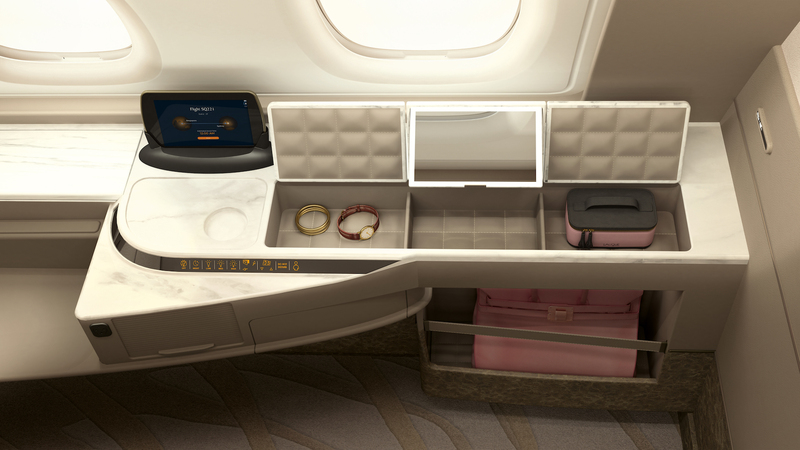 Share your thoughts on the new Singapore Airlines A380 cabins via a comment.